Chicago Cubs celebrate winning their first World Series Championship in 108 years. defeating the Cleveland Indians 8-7 in game 7 of the World Series. 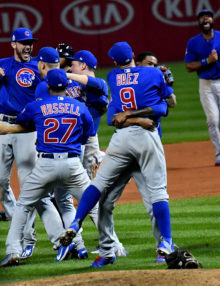 With the game tied 6-6 at the end of 9 innings,and after a 17 minute rain delay, The Cubs came out in the 10th inning to score 2 runs and go on to win game 7 and their first championship in over a century. 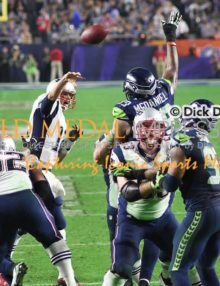 In one of the most exciting World Series games ever played, we have uploaded many iconic shots from the exciting game 7 of the World Series. One image which speaks volumes, “IT RAINED ON CLEVELAND’S PARADE”, captures the turning point of the game and series—a 17 minute rain delay that totally changed the momentum of the game in favor of the visiting team, the Chicago Cubs. With the score tied 6-6 at the end of 9 complete innings, an unusual and mysterious thing happened…. It started to rain. After an unusual and unplanned team meeting during those precious 17 minutes, the Cubs came out inspired and scored 2 runs, taking a 8-6 lead. 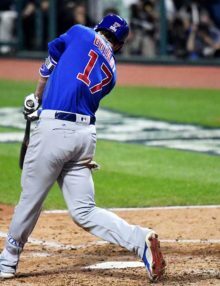 The Chicago Cubs defeated Cleveland Indians 8-7 in the 10th inning of game 7, ending a World Series drought of 108 years. 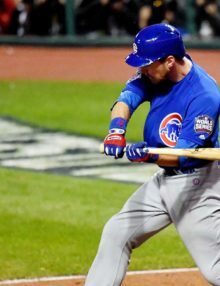 Chicago Cubs outfielder, BEN ZOBRIST, drives in the go ahead run in the top of the 10th inning with an RBI single off of Cleveland Indians reliever Bryan Shaw. ZOBRIST had a series high 10 hits and was named the World Series MVP. 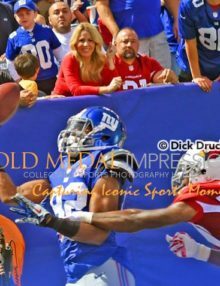 THE GREATEST OUT IN 108 YEARS. Chicago Cubs first baseman, ANTHONY RIZZO, reaches overhead for a ball thrown by third baseman KRIS BRYANT just beating Cleveland Indians MICHAEL MARTINEZ for the third out in the bottom of the 10th inning of game 7 of the World Series. 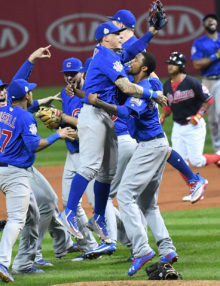 The Chicago Cubs defeated the Cleveland Indians 8-7 giving the Cubs their first World Series Championship in 108 years. 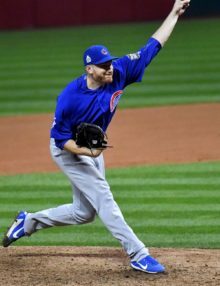 Chicago Cubs relief pitcher MIKE MONTGOMERY throws the most important pitch of year to Cleveland Indians pinch hitter Michael Martinez in the bottom of the 10th inning in game 7 of the World Series with 2 ours and runners on base. 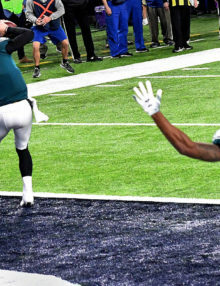 MONTGOMERY enticed Martinez to hit a ground ball to third baseman Kris Bryant who threw a strike to first baseman Anthony Rizzo for the third out and a World Series victory. Chicago Cubs outfielder BEN ZOBRIST holds up his MVP trophy after the Chicago Cubs defeated the Cleveland Indians 8-7 in 10 innings. 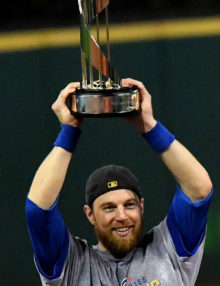 Zobrist drove in the tie breaking run with an RBI single in the top of the 10th inning, accumulated 10 hits in the World Series, and was named MVP of the World Series. 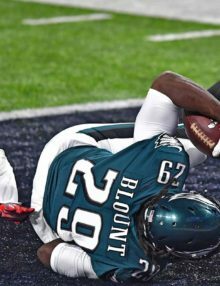 At the stroke of midnight with the score tied 6-6 at the end of 9 completed innings in game 7 of the World Series, Something unlikely and mysterous happened—it began to rain. 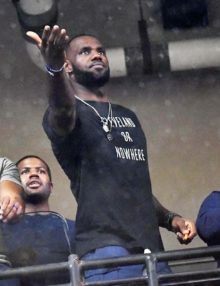 Cleveland Cavaliers hero LeBron James reached out to feel the rain. 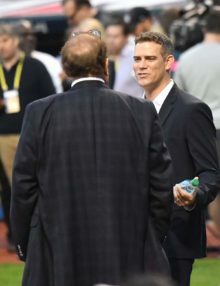 The umpires with input from MLB headquarters decided to delay the game and pulled out the tarp.the game was delayed 17 minutes and it totally changed the momentum of the game in favor of the visiting team–the Chicago Cubs. 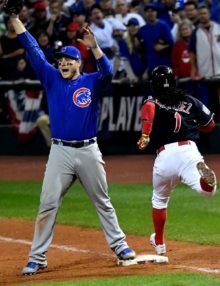 In the tiop of the 10th the Cubs scored 2 runs and went on to win 8-7, their first World Series in 108 years. 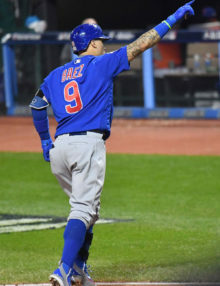 Chicago Cubs shortstop, JAVIER BAEZ, points to the crowd after hitting a home run in the top of the 5th inning. The Cubs went on to win 8-7 earning their first World Series Championship in 108 years. 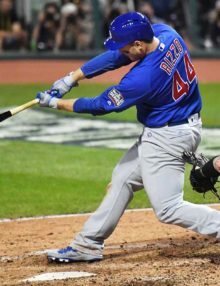 Chicago Cubs first baseman, ANTHONY RIZZO, doubles in the top of the fifth inning drivng in Kris Bryant, giving the Cubs a 5-1 lead in game 7 of the World Series Championship. The Cubs went on to win 8-7,earning their first World Series in 108 years. 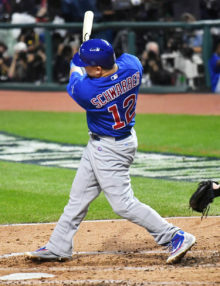 Chicago Cubs catcher and designated hitter, KYLE SCHWARBER, hits a single to lead off the top of the 10th inning with the score tied 6-6. 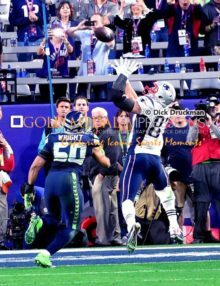 This hit triggered a 2 run rally by the Cubs to win their first World Series Championship in 108 years. 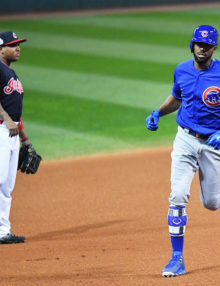 Chicago Cubs outfielder DEXTER FOWLER rounds third base after hitting a home run in the first inning of game 7 of the World Series giving the Cubs an early 1-0 lead. The Cubs went on to win 8-7 in 10 innings to earn their first World Series Championship in 108 years. 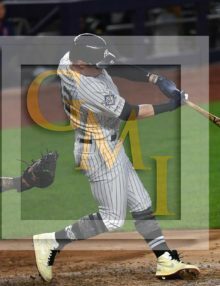 Chicago Cubs third baseman, KRIS BRYANT, singles against Cleveland Indians reliever Andrew Miller in game 7 of the World Series. The Cubs went on to win 8-7 and their first World Series Championship in 108 years. 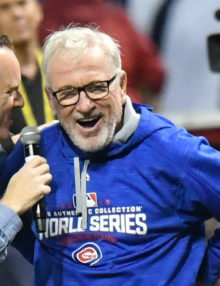 Chicago Cubs manager JOE MADDON is jubilant as he talks to a reporter after his team defeated the Cleveland Indiians 8-7 in game 7 of the World series. The Cubs earned their first World Series Championship in 108 years. 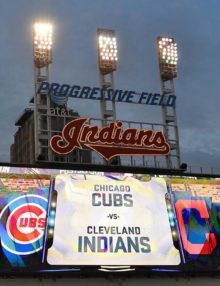 Progressilve Field Scoreboard for Game 7 of the World Series between The Chicago Cubs and the Cleveland Indians in Cleveland Ohio. The Cubs went on to defeat the Indians 9-7 and win their first World Series Championship in 108 years. 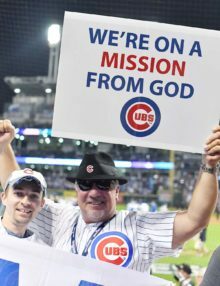 Chicago Cubs fans hold up a sign after game 7 of the World Series suggesting that their was DIVINE influence in this World Series. With the score tied 6-6 after 9 complete innings something extraordinary happened….it began to rain and the tarp was pulled out for a 17 minute rain delay. 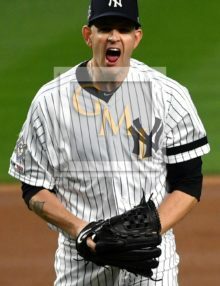 Prior to rain, The momentum was clearly on the side of the Cleveland Indians who rallied for 3 runs to tie the game 6-6. After the tarp was removed and the 10th inning began the Momentum changed and the Cubs came out all fired up and scored 2 runs and ultimately win their first World Series in 108 years. The Cubs went on to win game 7 of the World Series 8-7, their first World Series Championship in 108 years.